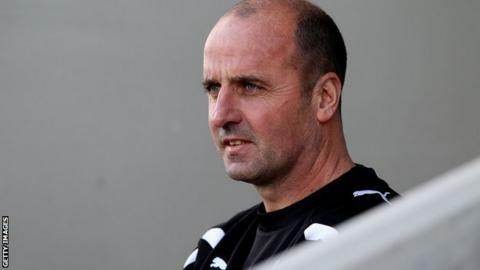 Chesterfield boss Paul Cook has suggested his players should feel the impact their form has on fans by travelling on supporters' coaches. The Spireites have lost three of their last four games in League Two and lie in 18th position. He told BBC Radio Sheffield: "Can I make the players travel on supporters' buses? I would. "We're 18th and it is not good enough by a mile. It's an embarrassment and the players need to feel that." He added: "We were in last Sunday and I thought about taking the players on a walk through the town and I knew we'd have got abused but I don't know if the players know that. "Somewhere along the line the players have lost an identity with the supporters. You have to feel the pain." Cook has won only one of his four matches in charge of the Spireites so far, a 6-1 victory against Hartlepool in the FA Cup. Meanwhile, the Proact Stadium side have terminated the contract of long-serving midfielder Mark Allott with immediate effect. The 35-year-old, whose deal was going to expire in the summer, played 385 games across two spells with the club. Allott's exit follows Cook's decision to tranfer-list striker Craig Westcarr and defender Neal Trotman earlier this week.